Enormous billows of smoke float upward to join the clouds. You gaze skyward and take in the elegant glass windows that compose the ceiling. All around there are people shuffling from one place to the next. The conductor bellows the last call for your train so you hop on and begin your journey to Hogwarts. The fresh cut grass is exceptionally green on this clear and sunny day. You are surrounded by a magnificent castle with ornate brick that has been around for hundreds of years. On the ground is your broomstick. You pick it up and begin your first flying lesson. Fantasy becomes reality at one of the classic Harry Potter filming locations. All across England and Scotland you can find the picturesque homes to many of the other iconic locations seen in the films. From Warner Brothers Studio to Alnwick Castle, there is something for muggles everywhere to enjoy! Warner Brothers Studio in London was home to the Harry Potter films for 10 years. Today, visitors can go and experience the magic for themselves by taking a tour of the studio. Guests are given the opportunity to explore two soundstages and a backlot filled with animated creatures, special effects, and original sets. A lot of the iconic sets were actually saved because the books were still being released while the films were being made.This allowed the production crew to keep a lot of sets, props and costumes in case they were needed later on in the series. Nicknamed the Harry Potter Bridge, this 100-foot-tall, 416-yard-long railway is best known as the track for the Hogwarts Express. Built in the 1890s, this is the first building in Britain to be built with mass concrete. Glenfinnan is situated at the head of Loch Shiel which stretches southwest for 20 miles to Acharacle. 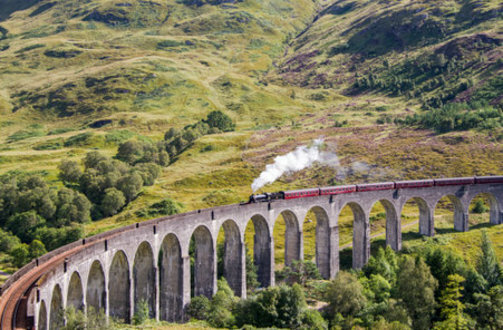 The train famously known as the Hogwarts Express is actually the Jacobite Steam Train. Looking to catch a ride? During the summer months, the train runs to Fort William and Mallaig. 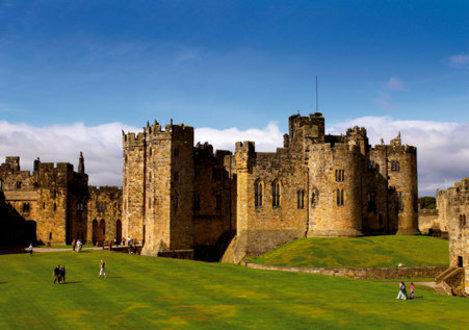 If riding a broomstick is on your bucket list, Alnwick Castle is the place for you. The iconic castle is used as the grounds where Harry has his first Quidditch lesson. In the summer, the castle now hosts broomstick training. Alnwick castle wasn’t only used for Quidditch in the films. This is also the site where the Weasley’s flying car crash-lands on the first day of school. The Lion Arch can be identified as both an entrance and exit to Hogwarts that heads towards Hagrid’s cabin. Today it is the second largest inhabited castle in England. Famously known as the home of the Hogwarts Express, King’s Cross Station has appeared in every movie. Finding platform 9 ¾ may prove to be a little more difficult. In real life, platforms 9 and 10 are not adjacent to each other. For the movies, they renumbered 4 and 5 and put 9 ¾ between those two. Today, there is a spot for tourists to have their picture taken with a cart running through the wall at platform 9 ¾.
Durham Cathedral can be identified as the quadrangle where Harry releases his owl, Hedwig, from his hands in Harry Potter and the Philosopher’s Stone. The next year, Durham’s UNESCO World Heritage Site is used as the setting for Harry, Ron, and Hermione to learn how to turn animals into water Goblets. Here at Crystal Travel & Tours we offer a Magical World of Harry Potter Tour that will guide you through all the exciting and magic-filled filming locations while also enjoying the beauty of England and Scotland!